^ Chisholm, Matt; Avnet, Jeremy. Truncated Trickery: Truncatering. theory.org. 1997 [2013-09-02]. ^ 埃里克·韦斯坦因. Truncated tetrahedron. MathWorld. ^ 埃里克·韦斯坦因. 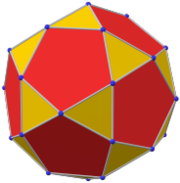 Truncated tetrahedral graph. MathWorld. 埃里克·韦斯坦因. Truncated tetrahedral graph. MathWorld.